"Would you make me a paper airplane?" Lunch time was just ending, and I didn't even have paper available when my son's classmate asked this question. I thought it was just a random request. Then the next time I visited the school, another child asked for one, and another, and another. In fact, they were still asking months later when I went in to have them write end-of-the-year thank-you notes to their teacher. Finally, I realized why they were asking. These classmates had been invited to my son's Planes themed party where we had a paper airplane race. Even simple STEM (science, technology, engineering and math) activities will catch the kids' attention every time. 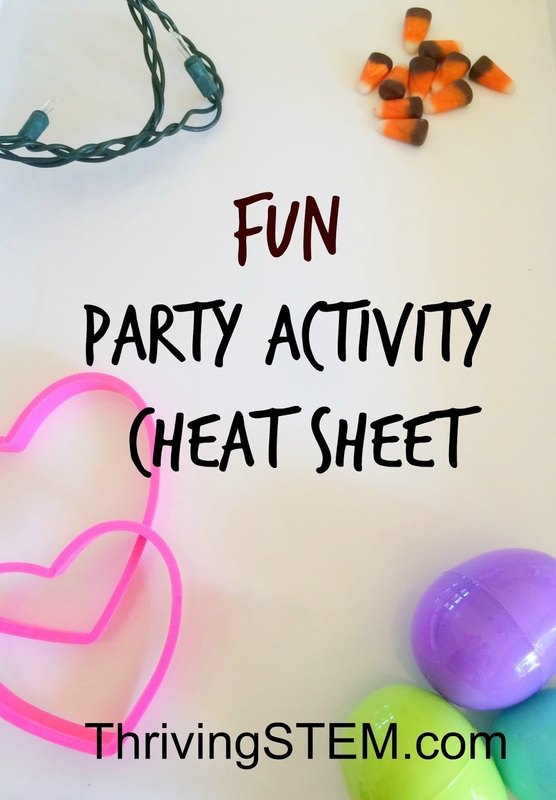 That's why I made a cheat sheet for moms like me (or awesome teachers who do parties themselves) who need some self-contained holiday activities for elementary classes to do this year. Click on the title to see what's involved in each activity, and then follow me on Pinterest where I have a growing collection of activities for each of these holidays, and others. Make Butter by Mama Smiles (top left). Kids will love how active this process is, and watching one food appear from another. If your school allows, bring bread for a snack. If not, send it home for families to enjoy. Build a Pumpkin tower by Lemon Lime Adventures (top right). A new way to build is always fun. Students can get creative or challenge themselves to build the tallest structure. Autumn Weaving by JDaniel's Mom (bottom left) These would look great in the hallway! She gives several more examples that your class might like to try. 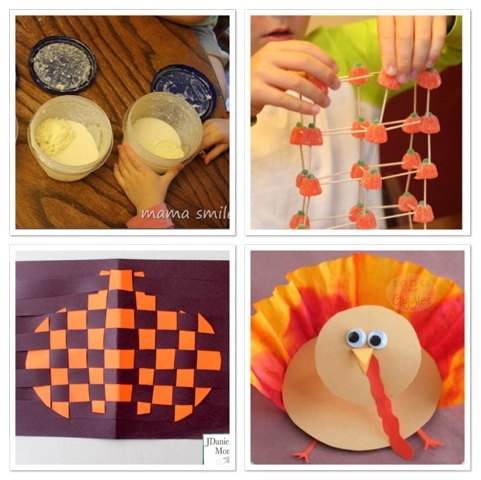 Coffee Filter Turkeys by Books and Giggles (bottom right) Diffusion is a fascinating process. This project takes full advantage of it and produces a really cute result. Turkey Zip Line by Growing a Jeweled Rose (not pictured). Anything that flies is going to be fun. Play Snow from Raising Life Long Learners (left) It's cold! You can add toys for pretend play with younger kids or tools for sculpting with the older kids. Beaded Icicles from Happy Hooligans (middle) Children will love making and bringing home their own beautiful ornaments. Slime Ornaments by Little Bins for Little Hands (Right) Although the name may not sound appealing to adults, these little globes would be irresistible to kids, and serve as a great take home treat as well. Tinker Trees by Left Brain Craft Brain. (not pictured) This is similar to the engine play activity we did at the party I mentioned earlier. 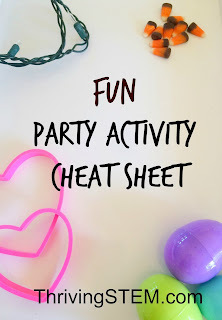 The kids at our party were really engaged, so I am sure this would be a hit as well! Creative Family Fun put together a great list of Holiday Treats that you can use even if your school has strict rules about nutrition and bringing things from home. Building Hearts from Little Bins for Little hands (top right) Kids love building, so this clever activity is sure to be a hit. Rainbow Heart Suncatchers by Fire Flies and Mud Pies (top right) Aren't these lovely. The children will love experimenting with color and making their own unique creations. 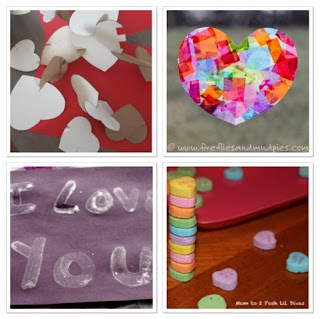 Secret Messages by Creekside Learning (bottom left) Make these, then send them home as a surprise for their families! Candy Heart Math by Mom to 2 Posh Little Divas (bottom right) She has several activities listed, but I especially like the idea of building with candy hearts. It would make a great competition. Light Circuit Valentines by Left Brain Craft Brain (not pictured) These are so clever, the children will want to keep them! Easter Egg Races by Little Bins for Little Hands (top) This would make a great game for older children, or simple activity for the little ones. Nest Building by Pink Stripey Socks (bottom left) Get out and enjoy the beautiful weather with this no-prep craft! 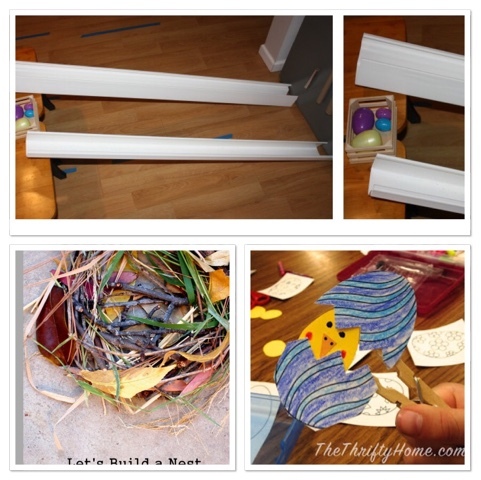 Hatching Easter Eggs by the Thrifty Home (bottom right) These are a super cute use of simple machines, that give the children a chance to be creative as well. Cup Weaving by B Art Z Elementary Art (not pictured) Use these as containers for candy or the eggs found on your hunt. These are the major party holidays for school kids here in the South East United States. What holidays do school children celebrate where you live? I'd love to hear about it in the comments. P.S. Here are a couple of more resources from Kid Bloggers for Public Education to help with your holiday planning: a thoughtful post on Holiday Celebrations in School by 3 Dinosaurs will give you some great hints on helping make the most of these parties for your child, and these directions for Children's Book Exchange as suggested by Books and Giggles would be a great way to make the most of any holiday where gifts are exchanged. 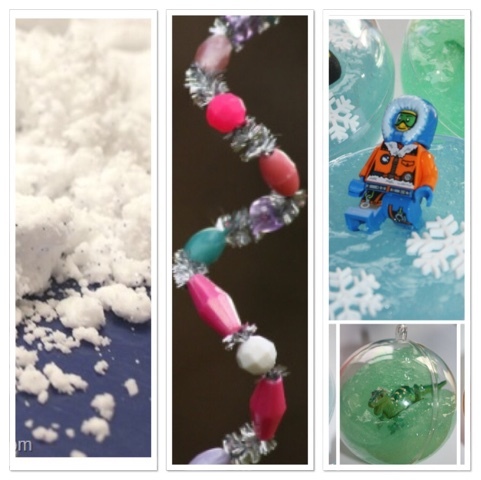 Sign up for the Thriving STEM Newsletter to get seasonal ideas for STEM learning each month.